Catherine and I went to see the Australian Tapestry Workshop. Catherine is more interested in textile arts than I am; textile arts still dominated by women and most of the people working on the workshop floor are women. The Australian Tapestry Workshop was formerly the Victorian Tapestry Workshop; the name changed in 2010 and the V logo of the Victorian Tapestry Workshop has been turned upside down to form an A. 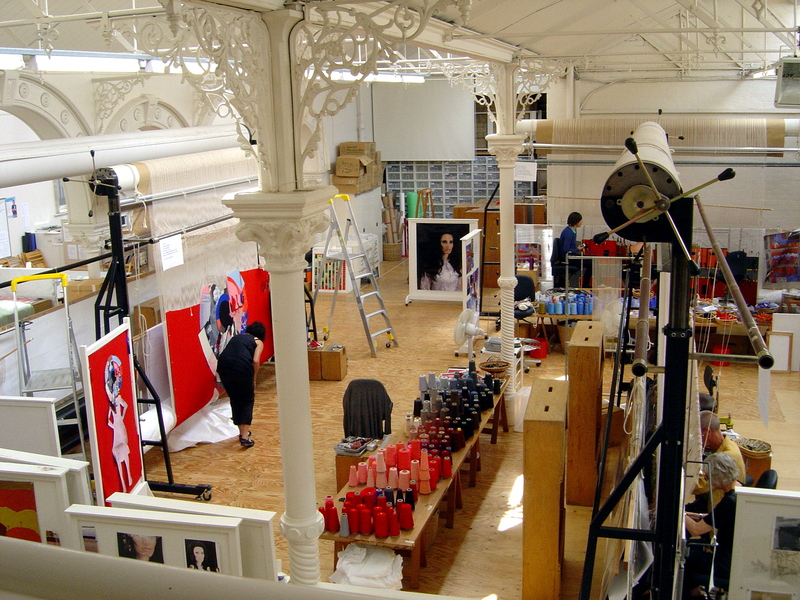 It is still located in the same 19th century building in South Melbourne that once held a knitting mill. The large work floor has become the tapestry workshop. Lace ironwork pillars support a saw tooth roof over the main floor. South Melbourne once had many textiles works and carpet factories; it now has restaurants, boutiques and media companies. An observation deck allows visitors to watch the tapestries being made on the four large looms on the main floor. Scattered around the main floor are pin-board dividers with samples, b&w and colour images of the art for the tapestries. When Catherine and I visited they were working on John Young’s “The Navigator” (2.3 x3.02m.) for the National Library of Australia. The weavers work in teams across large tapestries. Watching the one of the weavers mixing strands from half a dozen colours to create exactly the right blend of colour. The observation deck also allows the visitor to observe the yarn dyed in the small colour laboratory safely from behind glass. The workshop produces a 366 standard colour range of wools for sale at their shop and also dye their own wool specifically for certain projects. The Australian Tapestry Workshop has a shop and two gallery spaces exhibiting work for sale. I was particularly impressed with Merrin Eirth “Black Tomato’s Fleshy Heart” 2003, a tapestry in the shape of a kimono. Translating images from one media to another is not a simple task; woven wool is a very different material than paint. (Goya’s painting style always reminded me of tapestries and I was not surprised to learn that he had started painting the designs for tapestries.) The weavers at the Australian/Victorian Tapestry Workshop interpret the source artwork and the workshop has a reputation for translating contemporary art. Tapestries became popular in the Renaissance, as they were capable of covering the massive stonewalls of palaces dampening the echoes and they still serve this function in contemporary architecture. 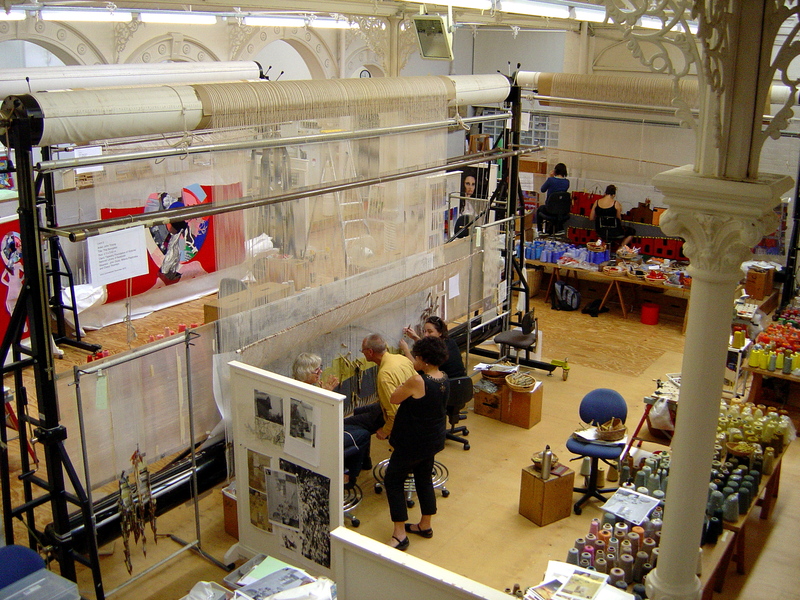 Over the 30 years of its operation, the Victorian Tapestry Workshop has made most of the large tapestries that currently hang in Australian public buildings. This entry was posted on Tuesday, February 8th, 2011 at 11:03 PM	and tagged with Australian Tapestry Workshop, South Melbourne, tapestry, textile art, Victorian Tapestry Workshop and posted in Art Galleries & Exhibitions. You can follow any responses to this entry through the RSS 2.0 feed.